The North-Atlantic right whale is one of the most endangered of all large whales, with a long history of human exploitation and no signs of recovery despite protection from whaling since the 1930s. The North-Atlantic right whale is mostly found along the Atlantic coast of North America, where it is threatened by entanglement in fishing gear and ship collisions. Some scientists believe these whales have already been extirpated from the eastern North Atlantic and now survive only on the east coast of the U.S. and Canada. Between 300 and 350 individuals still exist, but despite seven decades of protection efforts, no population growth has been observed. The right whale belongs to the suborder Mysticeti, and is characterized by a symmetrical skull, paired blowholes, and rows of baleen plates for feeding on plankton. This is a relatively slow swimmer, averaging about 8 kph (6 mph). It usually makes a series of 5 or 6 shallow dives and then submerges for about 20 minutes. Right whales emit a number of low frequency sounds, mostly during courtship. 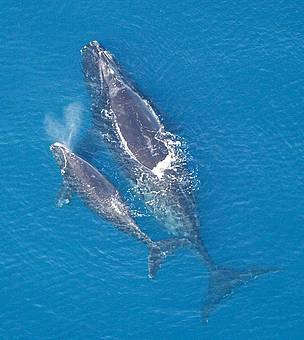 During the spring and summer, North Atlantic right whales migrate north to feed. Females head south in autumn to give birth to their calves in temperate waters. They usually do not fear boats and can be easily approached by them. The North Atlantic right whale can reach 18 m for females and 12.9 m for males. The species can weigh up to 96,000 kg. Whales and dolphins are a priority species. WWF treats priority species as one of the most ecologically, economically and/or culturally important species on our planet. And so we are working to ensure such species can live and thrive in their natural habitats. This large whale mostly inhabits temperate waters, and compared to other similar-sized cetaceans is found more often in coastal waters, especially during the breeding season. Whereas groups of North Atlantic right whales once numbered in the hundreds in feeding grounds, nowadays they usually travel alone or in groups of 2-3 (sometimes up to about 12). Groups splinter off for feeding, probably because of the sheer quantity of food required for each animal. These aggregations are not fixed, and individuals have been observed to change groups. One notable exception is in the Bay of Fundy, where up to two-thirds of the remaining population aggregates in the summer to feed. 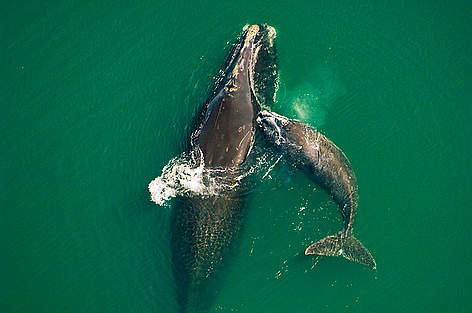 As with other mammals, right whale mothers and their calves display strong attachments, with the calf keeping in close contact with its mother by swimming up on her back or butting her with its head. Sometimes the mother may roll over to hold her calf with her flippers. Mating pairs are reported not to maintain long-term bonds. It is estimated that North Atlantic right whales live longer than 30 years. Females breed about once every three to five years. Gestation is about one year and the single calf is nursed for nine to 12 months. Pregnant females migrate to an area off the coast of Georgia and Florida to give birth between December and March and then migrate north to their feeding grounds in the Bay of Fundy. Scientists are confident there is at least one other nursery area but have yet to discover it. Where these whales mate is also a mystery. In their feeding grounds in the Bay of Fundy in the summer, right whales are often seen in what scientists call "surface active groups" - groups may consist of just a few individuals or as many as 40 - which involve males and females making vigorous body contact. It is presumed that this is some type of courtship behaviour, though scientists believe it is too early for actual mating to occur, given what is known about the gestation period. The function of this intriguing social behaviour is not yet well understood. North Atlantic right whales feeds mostly on copepods, and krill larvae. About 1,000 - 2,500 kg (2,200 - 5,500 lb) may be consumed every day. The North Atlantic whale feeds by swimming through a swarm of prey with its mouth open and the head slightly emerging on the surface. Having filtered the prey with its baleen plates, it drives out the water, dives, and swallows the food, a process known as "skimming". North Atlantic right whale (Eubalaena glacialis) off Grand Manan Island, Bay of Fundy, New Brunswick, Canada. Atlantic northern right whale with calf. The North Atlantic right whale was once found throughout the North Atlantic. Exploitation began around the 10th-11th centuries, with peaks between the 13th-17th centuries. By 1700 it was too rare to be of economic importance. This whale still occurs in parts of the Atlantic Ocean, from the Norwegian Sea, Davis Strait and Denmark Strait south to Massachusetts and Bay of Biscay in the summer. In the winter the range extends south to Florida and the Golfo de Cintra, western Sahara. The species is occasionally found in European waters, but is close to extinction in the eastern North Atlantic. Recent evidence suggests decreased survival and reproductive rates, an indication that the population may be declining. What are the threats to the North Atlantic right whale? North Atlantic populations have been decimated by historical over-exploitation by the whaling industry. 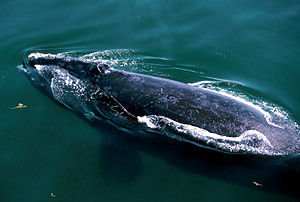 The species gets its names from early whalers, who considered them to be the "right" whales to hunt. Their slower pace, the fact that they come close to land, their tendency to float after being killed and their "productivity" in terms of oil made them lucrative animals to target. Today, the species is threatened by ship collisions, entanglement in fishing nets, and separation from calving areas because of shipping traffic. Since this right whale is found in coastal habitats, it is more likely to suffer from impacts of human activity than more open-water cetaceans. With such a small, slow-growing population, any threatening factor may have a significant impact. The effects of contaminants on cetaceans susceptibility to disease and reproductive performance is increasingly a cause for concern. For example, research has shown that North Atlantic right whales are significantly exposed to a potentially toxic, dioxin-like compound. 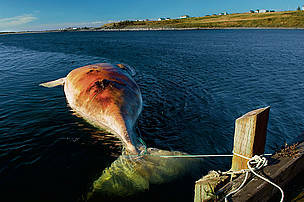 The carcass of a female Northern right whale (Eubalaena glacialis) killed by a ship collision, Nova Scotia, Canada. WWF has reached significant milestones regarding the protection of this species, including helping drive a shift of the shipping lanes in Canada's Bay of Fundy in 2003, thereby reducing the risk of ship strikes of right whales in Canadian waters by up to 80%. However, collisions in US and other Canadian waters remain a major conservation problem for the species. WWF efforts in this area over the coming years will be directed towards increasing awareness of the need for cetacean conservation at the national and regional levels, and to create opportunities for local communities to be involved in, and to profit from, cetacean conservation initiatives. Vote Earth by taking part in Earth Hour! As climate change is a growing threats for whales, we need to send a message to our leaders that warming must be limited to under 2 degrees Celsius. 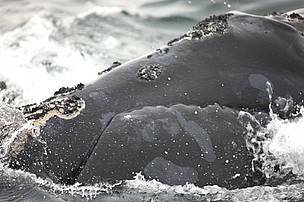 Scientists recognize individual whales based on their pattern of callosities – the white patches of rough skin that give right whales their characteristic appearance.